It seems like the majority of the US experienced something lovely this week: the first hints of fall. And those dropping temperatures and scents of drying leaves have sent many of us to the pantry searching for the one flavor that defines the season: pumpkin! I’ll admit, though, I don’t typically like pumpkin… unless it’s in pumpkin bread. And while many of the dishes so common during the fall and holiday season are full of sugar and other unsavory ingredients, this is one you can feel absolutely fine about serving to everyone in your family. It’s jam packed with healthful ingredients and so delicious no one will know it’s good for them. Sift together the dry ingredients (flour, salt, sugar, and baking soda). Mix together the wet ingredients (pumpkin, oil, eggs, and water) and spices. Add dry ingredients to wet ingredients, mix only until combined. Pour into a buttered loaf pan. Bake until a toothpick comes out clean, about 60-70 minutes. Ariane says: “My 2-year-old loves to bake. I hear ‘Let’s bake something!’ on a nearly daily basis as she starts pulling flour and sugar out of the pantry without so much as waiting for permission. The problem is she loves baking but doesn’t actually eat much of the resulting goods unless they are so unhealthy that I feel the need to limit her intake. Either way, I end up eating a lot of it myself. My pumpkin bread recipe (which I got from my sister) is almost the same as Ariane’s, except I’ve managed to cut the sugar down even more and eliminate half of the wheat (for the low-carbers among us). Instead of 1 1/2 cups of flour, use 3/4 cup of flax along with 1/4 cup almond meal and 1/2 cup whole wheat. The benefits of flax are pretty impressive, as it’s a great source of omega-3 fatty acids, dietary fiber, and lignans. It’s even shown to lower cholesterol in women, slow the growth of tumors, and help with controlling blood sugar. I also cut down the sugar by using 1-2 tsp of stevia (but check the sweetness of your brand of stevia–it can vary, and as it’s so sweet even a little too much can be overwhelming), and I boost up the flavor with 2 tsp of ground ginger and an extra tsp of cinnamon (since I dig really bold flavors). I also like to add either a cup of toasted almonds, pepitas, walnuts, or sunflower seeds for extra protein and crunch. 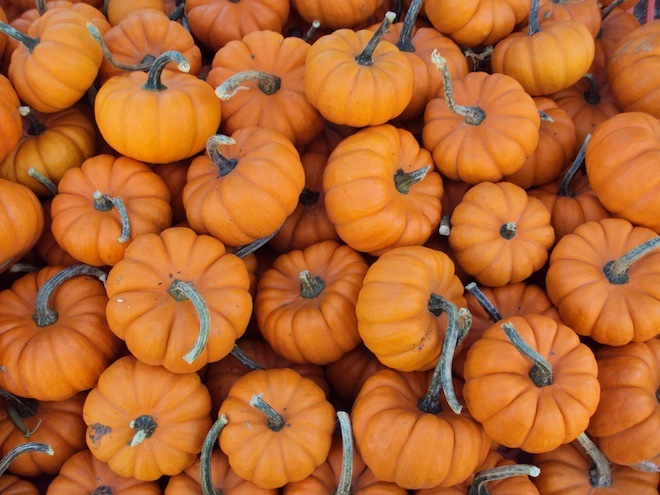 Pumpkins themselves likely originated in North America, and come in a wide variety of colors, sizes, and shapes (being in the gourd family it sort of comes with the territory). In spite of the many faces of the pumpkin (pun intended) the smaller, orange-skinned sort are best for cooking with. You’ll sometimes see these labeled as “pumpkin pie” pumpkins. You can make your own puree quite easily by cutting the pumpkin in half, removing the seeds, and baking at 350°F for about an hour. Once cooled, you can scoop and store (and it’s great as baby food, too). Do you have a pumpkin bread recipe you can’t live without? Share them in the comments! We always love to hear a spin on an old favorite, especially one including that lovely harbinger of all things autumnal!